Heat stress includes a series of conditions where the body is under stress from overheating. Heat-related illnesses include heat cramps, heat exhaustion, heat rash, or heat stroke, each with its own symptoms and treatments. Symptoms can range from profuse sweating to dizziness, cessation of sweating, and collapse. At greatest risk of heat stroke are the elderly, children, and people with medical conditions, such as heart disease. However, even young and healthy individuals can succumb to heat if they participate in strenuous physical activities during hot weather. Certain behaviors also put people at greater risk: drinking alcohol, taking part in strenuous outdoor physical activities in hot weather, and taking medications that impair the body’s ability to regulate its temperature or that inhibit perspiration. Heat stress can be induced by high temperatures, heavy work loads, and clothing inappropriate for the heat and humidity. The signs of heat stress are often overlooked by the victim. The individual may at ﬁrst be confused or unable to concentrate, followed by more severe symptoms, such as fainting and/or collapsing. 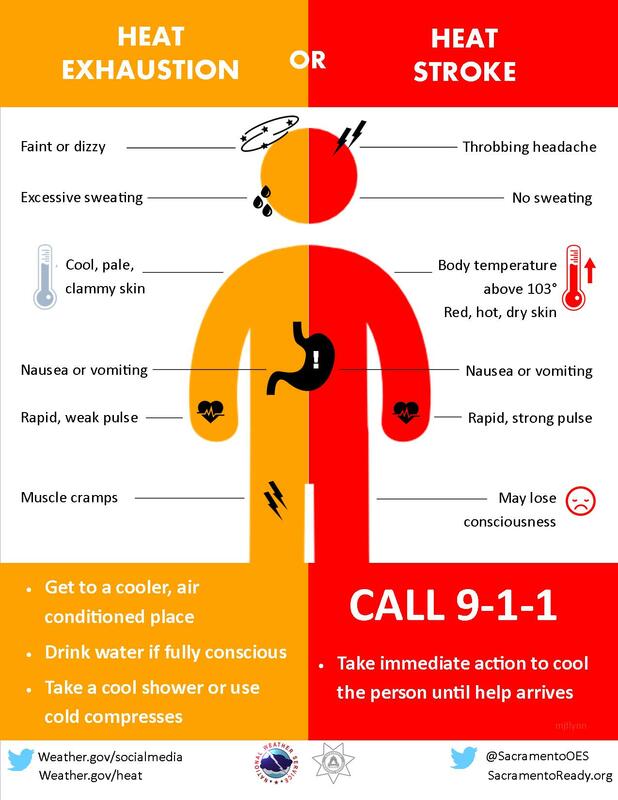 If heat stress symptoms occur, move the victim to a cool, shaded area, give him or her water, and immediately contact a supervisor or another individual to provide assistance. Some employees are more likely to have heat disorders than others. Employees with heart, lung, or kidney disease, diabetes, and those on medications are more likely to experience heat stress problems. Diet pills, sedatives, tranquilizers, caffeinated drinks, and excessive alcohol consumption can all exacerbate heat stress effects. It often takes two to three weeks for employees to become acclimated to a hot environment. This acclimation can subsequently be lost in only a few days away from the heat. Thus employees should be more cautious about heat stress after coming back from a vacation, when beginning a new job, or during the season’s first heat wave. In short, precautions should be taken anytime temperatures are elevated (approaching 90 degrees F) and the job is physically demanding. Other heat stress factors are also very important. In addition to temperature, increased relative humidity, decreased air movement, or lack of shading from direct heat (radiant temperature) can all affect the potential for heat stress. Allow time for employees to adjust to hot jobs when possible. It often takes two to three weeks for an employee to become acclimated to a hot environment. Adjust the work schedule, if possible. Assign heavier work on cooler days or during the cooler part of the day. Reduce the workload. Increase the use of equipment on hot days to reduce physical labor. Establish a schedule for work and rest periods during hot days. Train workers to recognize signs and symptoms of heat stress disorders and be prepared to give first aid if necessary. Choose appropriate employees: Avoid placing "high risk" employees in hot work environments for extended time periods. Realize individual employees vary in their tolerance to heat stress conditions. Learn to recognize the symptoms of heat stress. Pace the work, taking adequate rest periods (in shade or cooler environment). Use adequate fans for ventilation and cooling, especially when wearing personal protective equipment (PPE). Wear light-colored, loose clothing (unless working around equipment with moving parts). Keep shaded from direct heat where possible (e.g., wear a hat in direct sunshine). Drink plenty of water: in hot environments the body requires more water.